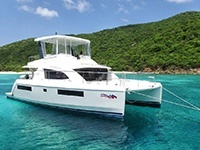 The Moorings 433PC is a powerful, well-balanced catamaran. She represents the future of power boating. 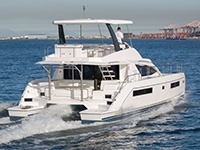 But do you know the advantages to owning the Moorings 433PC versus other powercats on the market of a comparable size? The truth is, they don’t compare. 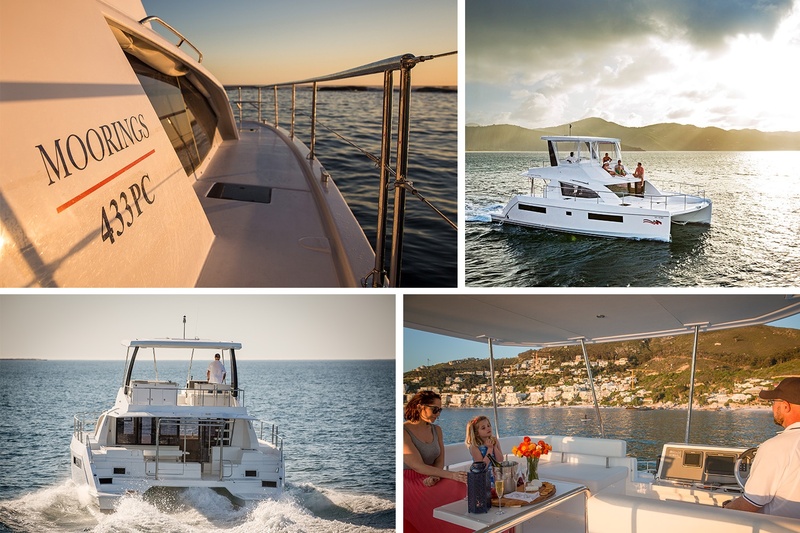 We have put together a list of the TOP 10 advantages of owning a Moorings 433PC—discover them below! The spectacular hull extensions house the propeller tunnels, helping create the 433PC’s great performance and efficiency. 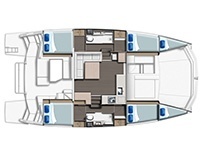 As the Architect explains, “To set the Moorings 433PC apart from other boats in direct competition, we designed a hull shape which would be less sensitive to trim over a range of loading conditions at different speeds.” – Alexander Simonis, Naval Architect/ Designer of the Moorings 433PC. 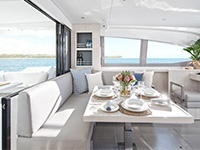 You can take family members and friends for an excursion aboard and it doesn’t feel crowded, yet you can easily dock and operate the Moorings 433PC with just two people. 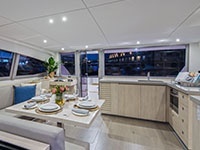 The multiple areas such as the flybridge, saloon, aft cockpit and foredeck allow all generations to find their ‘own’ space whilst maintaining enough room for a comfortable family dinner in the saloon/ aft cockpit. 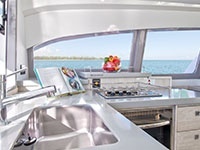 The layout in the Moorings 433PC is a chef pleaser—the galley is located forward and the forward-facing settee and table are now located aft. 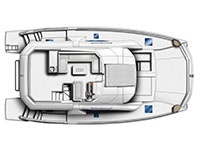 This allows for a panoramic view with large sliding glass doors between the saloon and the aft cockpit. Her design features grey king tree flooring and cabinetry, creating a fresh modern look. 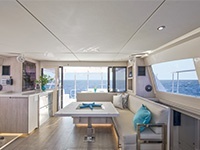 The airy colors are accentuated with jewel-like features and provide a contemporary atmosphere aboard the Moorings 433PC. Reliable and powerful. 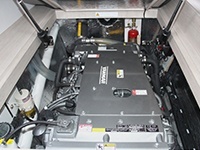 The Yanmar 320 hp engines provide more power and more speed to an already sleek and nimble hull design. The engines are both modern and efficient, and they provide a performance that we guarantee will not disappoint. 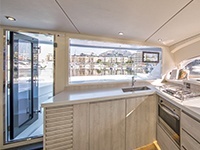 The door on the foredeck transforms the functionality, not only giving an excellent avenue for guests to travel forward but also to allow breeze back into the boat at anchor. The interaction between the different spaces, provided by the forward door, gives incomparable access between the different living areas and added ventilation. 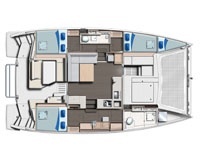 The starboard hull of the Moorings 433PC can be entirely dedicated to a spacious owner’s suite. 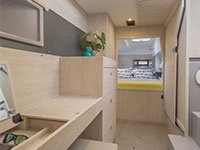 It includes a seating area, a private head and double berth. Additionally, the owner’s suite provides plenty of closet and storage space. 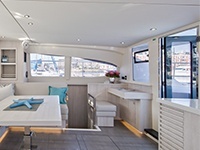 In the port hull your guests can enjoy two comfortable cabins and a shared head. 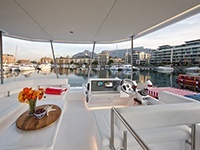 This boat is also available in a 4 cabin version with the port hull mirrored on the starboard side. 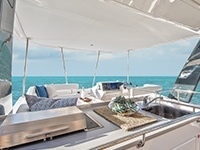 The enormous flybridge on the Moorings 433 PC includes a grill, a wet bar and direct access to the sunbathing platform found forward. 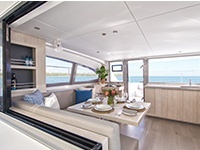 Other powercats of this size cannot compete with the features and space that this flybridge provides. With the Moorings 433PC, you have room for all of your hobbies! 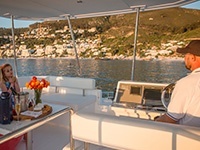 Ample storage space can be found throughout the yacht, including in the aft cockpit, the flybridge and the foredeck. As a bonus, you are provided with additional storage space under the floorboards. With the helmsman sitting comfortably on the flybridge, maneuvering is not only easy— it is enjoyable! And thanks to the distance between the propellers, she provides excellent slow-speed maneuverability, and her shallow draught allows you to go where most motor yachts of this size simply can’t. 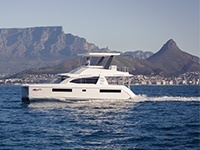 The helmsman also has the ability to steer the boat with the autopilot. Her seaworthy and well-proportioned lines are what make the entire look of the yacht appealing. She is well-balanced and agile. 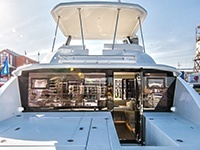 Additionally, the meticulously integrated flybridge provides style and stability. If you want to see the Moorings 433PC in action click here to watch the video, and contact us today for more information. 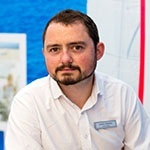 Julian Adams joined Sunsail in 2004 and has worked in various roles including Yacht Skipper, Charter Sales Consultant and Worldwide Sailing Schools Manager. In 2010 he joined the Sunsail & The Moorings Yacht Sales team and has gained extensive experience in all aspects of Yacht Ownership.